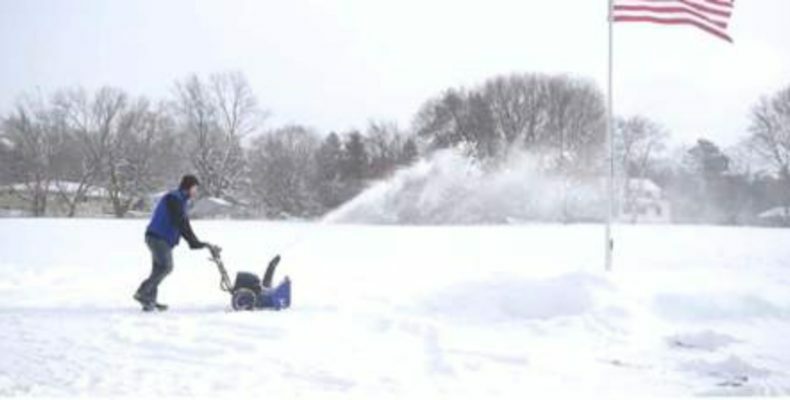 Usually cordless electric snow throwers / blowers are wimps and wusses – compared to gas powered equipment. But, the Snow Joe iON8024 XRP – using a 2,500 watt brushless motor – driven by an 80 volt power push – combining two 40 volt rechargeable lithium-ion batteries – will deliver an inordinate amount of force. Watch it drive 13 inch deep snow off driveways, sidewalks, porches, or pretty much anywhere you need to remove snow – clearing up to a 2 foot wide swath with each pass. It’s almost unbelievable that this 2-stage snow clearing piece of equipment will move over 27 tons of snow in only an hour! That’s 1,000 pounds per minute! Heck, I could probably use it to remove snow from my roof – if the roof was fairly flat to keep me from falling off. I know I could hoist it up there. After all, it only weighs 100 pounds. Both batteries – together – will last about an hour on a single charge – running the snow blower at full power. This snow chomper will not slow down as the batteries get low. It will run at top speed. Then, when the batteries are depleted, the unit will just stop dead in its tracks. If clearing the snow takes more than an hour, it would be a smart move to keep an extra 1 or 2 charged batteries on hand. The IBAT40XRP battery is compatible and interchangeable with all Snow Joe and Sun Joe iON products. With the extra batteries, the dual battery charger supplied with the snow blower can be doing its job charging the next set of batteries while snow clearing can carry on. It takes a couple of hours for the batteries to charge completely. An onboard, illuminated push button display control 3 forward speeds, 1 reverse speed – and a transport (xport) option to get you back to the garage when the job is done. There is also an on-off switch for the front LED headlights and a battery level indicator for each of the 2 batteries. 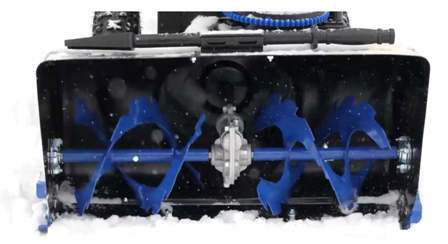 Being a 2-stage machine, the iON8024 XRP collects the snow with augers – feeding it into the impeller which throws the snow 32 feet up and out of the discharge chute. The only snow removal system better than this would be a 3-stage machine which adds an accelerator to the configuration. 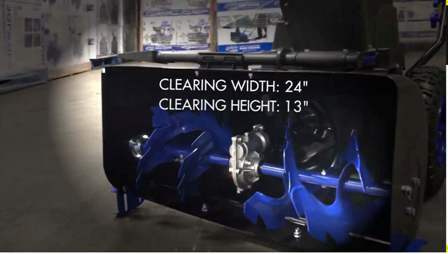 If more oomph is needed, check out the 3-stage snow throwers / blowers over at Snow Thrower Reviews. There’s also some great background info on the reviews page. 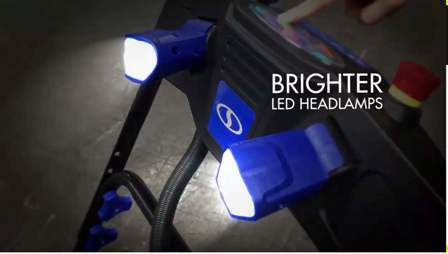 Surprisingly bright LED lights pierce through the early morning or evening darkness for a clear examination of the white stuff that needs to be removed. Don’t forget about the handy thumb switch – used to rotate the discharge chute up to 180 degrees. Then, there are those large, knobby tires – engineered for maximum traction in slippery environments. A full 2 year warranty shows that Snow Joe stands behind their product and is confident that it will continue to operate in extreme weather conditions for at least this long – and, most likely, a lot longer than that! Go Slow – Let the snow blower do all the work. Keeping the Snow Joe in low speed gives the augers time to chew the heck out of tough, compacted snow and improves overall performance. It also lowers the risk of clogs in the impeller and discharge chute. Overlap Drifts – When mowing a lawn, it is best to overlap by about 25% grass that is already cut. The same holds true for snow blowing. Overlapping a snow drift keeps the equipment from trying to “bite off more than it can chew” – further helping to prevent clogging. Remember when Mama told us that our “eyes are bigger than our stomach?” That analogy can be carried over to many things – including a way to prevent overstuffing and unnecessary exertion for the snow blower, too. Remove Snow In A Timely Manner – Get out there and start getting the snow out of the way BEFORE it has a chance to turn into ice. That goes a long way to using – and not abusing – the snow blower. Keep Ice Melt On Hand – It is best to pre-treat driveways and sidewalks prior to a big snow storm. It aids prevention of ice forming. But, if there isn’t time, then at least throw some down after the snow is cleared. Icy areas can cause accidents to happen at the most inopportune times – and, we don’t want anyone to be injured by slipping and falling. Besides, many folks file lawsuits these days – and Ice Melt is a very inexpensive way to help avoid this pitfall. 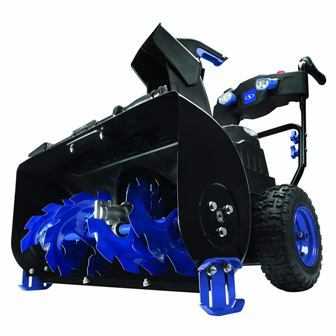 A finer cordless electric snow blower cannot be found that can equal or surpass the Snow Joe iON8024 XRP 2-Stage Snow Blower. And, if you hate gas powered engines, then this is the ticket, for sure! Take some time and look over the tips and other great snow thrower / blower possibilities in the Snow Thrower Reviews. You’ll be glad you did! I welcome comments or emails from both seasoned snow thrower / blower owners – as well as those of you who are finally ready to toss your snow shovel into the back of the garage where it can never be found again! I was always worried about using an electric snow blower. My battery operated tools for the lawn never seem to stay charged. What special storage is needed in the summer to ensure the batteries last? I finally figured out that my tools do not stay charged because the temperature in my garage gets too hot and ruins the batteries. Is this an issue with these batteries? Lithium-ion batteries for the iON8024 XRP snow blower that are stored during the off season should not be fully discharged during storage. They should contain at least a 40 percent charge and be kept fairly dry and cool – as close to 60 degrees Fahrenheit as possible – and out of the sun. The best scenario if to have other lawn and garden equipment that can use these batteries. If not, then once you ensure the “minimum storage charge”, wrap the batteries in some shop rags or insulation and store them in the coolest corner of your shed or garage. That should give them adequate protection until that white stuff comes back to haunt you next year! I watched the video for the Snow Joe iON8024 on YouTube. The fact that this snow blower can be powered with a DC source using lithium-ion batteries makes it even more appealing not only to me but, I’m sure, to many other people as well. Since it is electric powered, the noise is reduced, and it still does an incredible job. And, after watching the video, I can truly see that this snow blower really and truly can completely clear my driveway, my sidewalks, and my front porch. I think every home in the snow-belt should have this equipment available. The iON8024 is, for sure, the quietest way to remove the snow without disturbing the neighbors in the wee hours of the morning – which is when I am usually out moving snow around – before I head off to work! That’s really hard to believe, 1000 pounds per minute. That’s amazing! It sounds fairly easy to run and I’m sure that headlights would come in handy. I personally think that being able to point and aim in whatever direction you choose is great too, it would be a lot easier building snow fun for the kids. What would happen if it did clog, just wait for the snow to melt or? Would you suggest this for large driveways or just a standard small one? We owned a small blower once and for a small driveway it did serve its purpose and did create some fun for our kids but I think with a larger driveway it would be time consuming and cold. I usually get my snow blower unclogged with an old broom handle. On rare occasions, when the chute is too tightly packed, I give the snow blower a break in the garage and get out the hair dryer. And, after a couple minutes of warm air, the snow loosens up in the chute just enough to push it out. 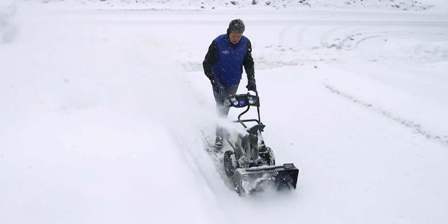 This was a great review of the Snow Joe Ion 8024 XRP 2-stage snow blower! I am in the market for a snow blower for our office in International Falls, Minnesota and, believe me, we get snow and cold up there! I was raised there and can remember the days, weeks, and months of the white stuff with no break. Although I am not there at the moment, we have the office and, people who have to be able to get clear access to the office. This means I need something there for the maintenance people to get on right away after a storm to clear the parking driveway and sidewalks. I did not want to go with a gas and oil version like we had when I was growing up, as it is more than I need. That thing weighed a ton too and was not easy to maneuver plus it tended to get clogged up. The video you added showed me clearly that this is a much better option! Going to check it out right now, and I appreciate your detailed and honest review. This is a snow blower that we can use! Glad to see that the iON8024 XRP is a valid choice for your needs. I’m sure you won’t be disappointed. This is a really great machine that will keep your office accessible for everyone. When you’re in the “land of snow”, it pays to have the best equipment to keep that white stuff in check! I recently purchased this product to replace my current snow blower. I have a medium size commercial parking lot that gets plowed by a local vendor. We have to do a lot of clean up (in Vermont we get to do a lot of snow removal) around the edges and along many pathways. We also have a flat roof overhang that we have had to shovel in the past. We have been using the new snow blower for all of these areas with great success. I would recommend it for anyone! Thanks for sharing this product. Glad to hear the iON8024 is satisfying your snow removal needs. 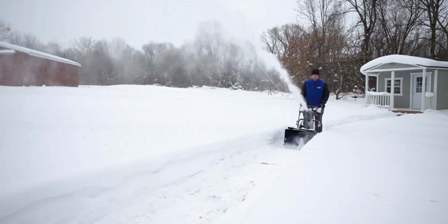 Using a commercial snow removal service for extra large areas is common – and, it is also very common for them to leave a lot of snow in more confined areas that shouldn’t be snowed over. Many folks don’t realize that they will still have to “clean up” after these snow removal services. But, I sure would like to see how you’re getting this cordless, electric snow blower up on your flat roof to clear it off. That is a feat in itself! I have been considering getting a snow blower since my back surgery last year. This looks like a great option and the price being under a thousand dollars is a huge plus to me. I was just wondering how much the batteries are if you need to replace them? I’m fortunate enough to live on Cape Cod and winters aren’t that bad for the most part but when we do get hit we get it hard. I will be purchasing one as soon as I get the go ahead from the Mrs. This little snow blower will be a blessing for your back. I’ve had back issues, too. So, any time I’m on snow removal detail, I make sure that I wear my back brace. It saves a lot of wear and tear on this ole body! The way I convinced my “better half” that we should buy a snow blower was by handing her a snow shovel when my back was on the mend. Within a week, we had a great snow thrower / blower delivered – just in time to clear the next foot of snow that arrived. 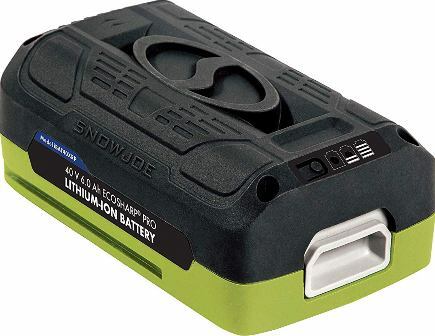 The replacement batteries aren’t cheap but, they are well worth keeping a couple of backups that can be swapped out – so you can keep on pumpin’ and dumpin’ snow while the drained batteries are recharging. Here are the details for the iON40XRP battery that’s used on the iON8024 XRP snow blower. This is the perfect machine for anyone having to deal with snow in huge amounts, especially like those people living in the Northeast. I lived in Maine for about 7 years and I did snow clearing by shovel every day. And, without a snow blower, it took me a long, long time. I shovel awhile and then stop and go in for a bit for some hot chocolate and then start again. Over and over. One question I had. At the top it says you can run it at full power using both batteries for 6 hours but at the bottom of the article it says you would have to go back and recharge after just an hour. Which is it? Great article and greatly needed for areas with high snow. Anyone who has spent time in the deep snow drifts in Maine surely knows the benefits of being able to use a snow blower instead of a Teflon-coated snow shovel. I’ve had my share of shoveling days – interspersed with hot chocolate breaks – too! The “6 hour” battery time was a “typo” which has been fixed – thanks to your eagle eyes catching it! I only wish I had batteries that would last that long. But, in actuality, an hour is about the best a lithium-ion battery can do before needing a recharge. This Snow Joe is powerful and the rate at which it can remove snow is astonishing. Additionally, I was surprised that it could be used even on a roof as long as it’s flat. 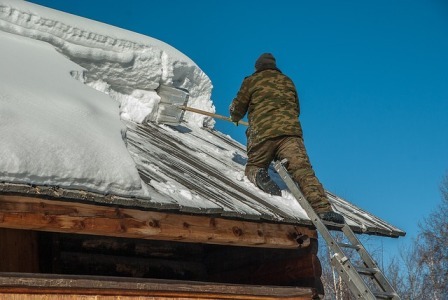 But, if the roof isn’t flat, I can see that it would be way too slippery because, even trying to remove the snow with a shovel on a slanted roof if difficult at best. You’re right. You certainly don’t want to try operating any snow blower on a roof that isn’t very flat. But, if you were going to use one on a roof, the iON8024 XRP would be a great choice. Snow can add a tremendous amount of weight to any roof – most especially the flat ones since there is no way for the snow to slide off. It just stays there until it melts. I was unaware that they had started to make such a fantastic machine! Thanks to you I know which one this old girl will be getting for next year – thankfully the snow this year has not been too bad and I have been able to take the shovel to the most of it. This snow blower is light weight for anyone to use even a woman of my size (I am a tiny person). Looks like that battery life would be all that I would require for the amount of area that I need to clean as well which takes me approximately a couple of hours by hand. My question is about the inserting the batteries into the machine is it difficult, because I do know with some of the power tools I own that getting the batteries clipped in properly can take some muscle? It’s amazing what progress gets you. Now, we have a cordless electric snow blower like the iON8024 XRP that is darn near a strong as a gas-powered one. And, these things sure do beat any snow shovel ever made! The batteries go in fairly easily on this Snow Joe – clicking into place with only a few pounds of pressure. So, I don’t think that you will have much of a problem either putting them in – or taking them out. Thanks for this helpful review. You sold it to me. Powerful, cordless electric and light weight. Almost everything I am searching for. It looks like this is a good choice, especially, with the testimonials to prove it. I have question. Is there any Snow Blower robot? I have a robot to cut the grass. It’d be cool to use robot to clean my yard from the snow. Another convinced customer! Glad to hear I’ve sold you on the fact that this snow blower will serve all your snow clearing needs. But, I gotta tell ya – even though there isn’t a snow blower robot yet – I bet they have one on a near future horizon. Can’t get beat by grass cutting robots, can they? It is interesting that I should find this article since I am in Finland right now and there is about 3 feet of snow on the ground. And, here, they are super efficient clearing the snow off the streets and keeping everything running smoothly. When I lived in the UK, however, they were useless at removing snow. I think it might be because they don’t get it often enough to really know what to do. But, as a home owner, I think that this snow blower would be perfect in Finland. Its uses would be greatly appreciated by both single house owners and businesses. Clearing snow with just a shovel is a back breaking job. I see that you say it is best to go slow. But, I wonder if there are statistics about how much snow this Snow Joe can clear in an hour? I am thinking that, given the amount of snow you get in Finland, the iON8024 XRP would feel right at home in your snowy country! In the first part of this article I mention that this Snow Joe can move 27 tons of snow per hour – or, about 1,000 pounds per minute. I’m not sure what that equates to in square footage cleared but, even moving slowly, I’d be willing to bet that it can clear a 1,000 square foot driveway in under an hour! I assume that power outages are a common thing in snowbound Finland. Thus, I would think that there must be quite a few home owners and businesses that own standby generators, too – like the Generac 7043 – or, the Briggs and Stratton 40396. As a minimum, they probably have a reliable portable backup generator like those I list on my Generator Reviews page. I am impressed by this cordless electric snow blower! There are so many places around the world that have been getting a lot of extra snow lately and the Snow Joe looks like just the ticket to easily dig them out from under the frozen mess. I can see that this Snow Joe has all the latest technological advancements with its increased battery life and power. That’s why it is a much better machine than older electric snow blowers! Yep. 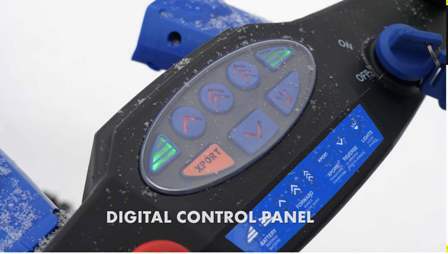 The iON8024 is a good one and, as you say, it has the most recent technical advances – which enhances its durability and ability to do a much better snow clearing job than previous makes and models. I can’t see why someone living in a snow ridden area wouldn’t jump at the chance to have one of these puppies available when the heavy snows hit them! Wow, the Snow Joe iON8024 XRP is no doubt a powerful machine. It’s amazing what a 2,500 watt brushless motor is capable of doing! It has so many great features that are not always found on other electric snow machines. My only concern is the cost seems to be on the high side. Other than that, it is a real deal! I think anyone would be lucky to have this snow blower. It is truly a five star product! This Snow Joe definitely has one of the largest brushless motors n the cordless electric line of snow blowers. That is what makes it so double dawg powerful! As far as the price – there’s an old saying – you get what you pay for. And, with the iON8024 XRP, you’ll get a bunch more than your paying for. That’s a downright certainty! This is a great post with some good info on this cordless electric snow blower. It comes at just the right time because, this is something we need now. There is a lot of snow here and we are struggling to get rid of it. The price looks pretty decent so, I will show this review to my wife. I think she will be just as happy with this machine as I am. I can guarantee you that both you and your wife will be thrilled to own this baby. Using the iON8024 XRP to eradicate the snow on your driveway, sidewalks, and porches is so very much better than the endless hours of shoveling you would have to deal with if you didn’t have it. After you’ve used the Snow Joe a few times, let me know how you like it!